Posted by thejinx in art, eyes of a dragon. As the title makes clear, this is a blog about my art and writing, right? And while I honestly haven’t finished any art yet this year and I don’t share my novels online, that doesn’t mean I don’t have anything to post. And while I still don’t have much to share, there is no excuse for letting it pile up a bit anyway. While this drawing has been on this site for a while, I never made note of it. This is the villain of my novel Eyes of a Dragon, and one of very few times I have drawn an older character. 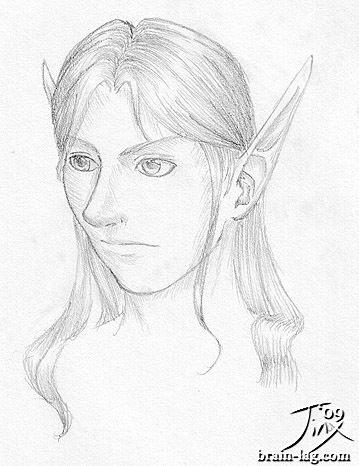 My first sketch of 2010, done on the last day of January, this is the star of Eyes of a Dragon, Jeremy. The face was based on a photo of figure skater Jeffrey Buttle and the hair was loosely based on a photo of my own. I don’t know when I’ll have new art to share, finished or otherwise, but I have some short writing to post here in the near future, so stay tuned. I really need to start drawing more. Yes, I missed yesterday. Today, some more sketches based on models I built in FaceGen Modeller. 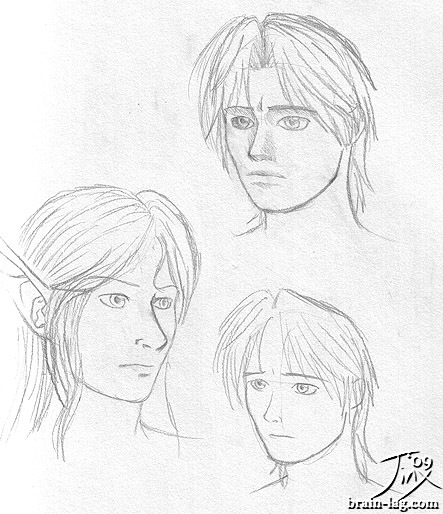 On the right is Jeremy, the star of Eyes of a Dragon, first in a sketch directly done from the model, then in a more stylized version. 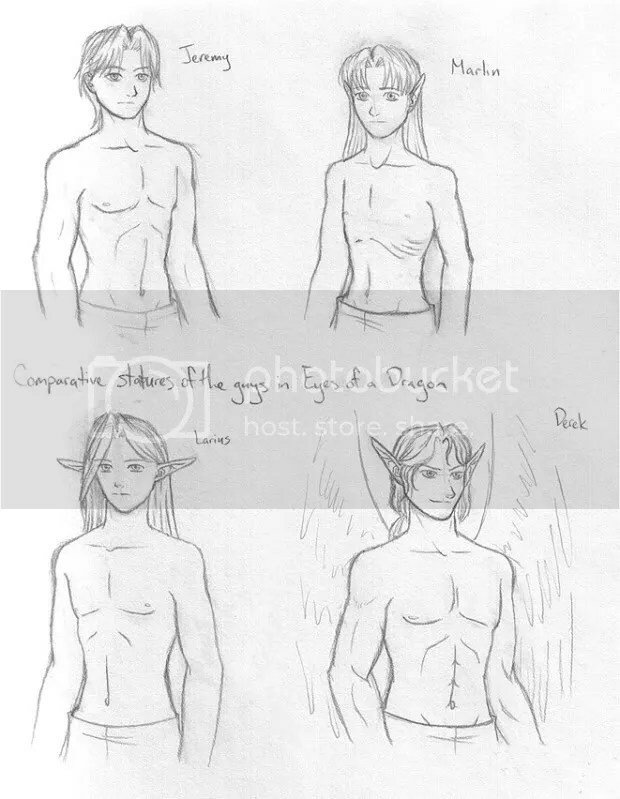 On the left is a second sketch from the model of Derek from the same story, which I keep tweaking. The model, that is. The likeness there is pretty close to how I envision him, though I think some shading might be needed to portray him properly. Also, I’m sorry to say that finished art, and updates in general, are likely to become scarce as I am now working again. On the bright side, more money for art supplies? Derek again, in a quick (~20 minutes) sketch based on a render I made this morning in FaceGen Modeller. Incidentally, I highly recommend that program as a reference for artists. Today’s sketch is a profile of the last major protagonist – as it were, he’s something of a complex case – in Eyes of a Dragon, Derek. 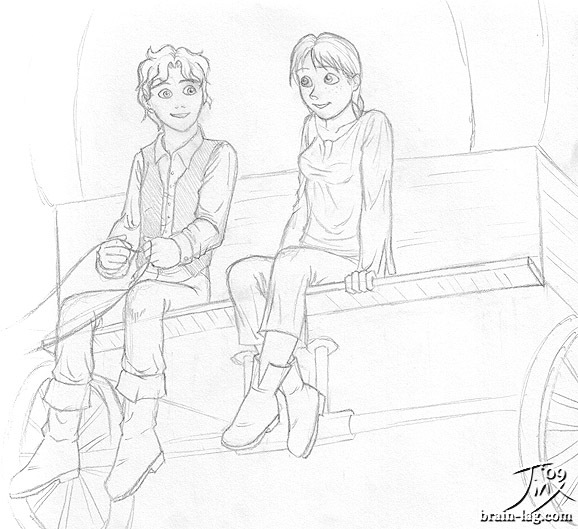 Today’s daily sketch is also another glimpse into the past of the characters in my novel Eyes of a Dragon. 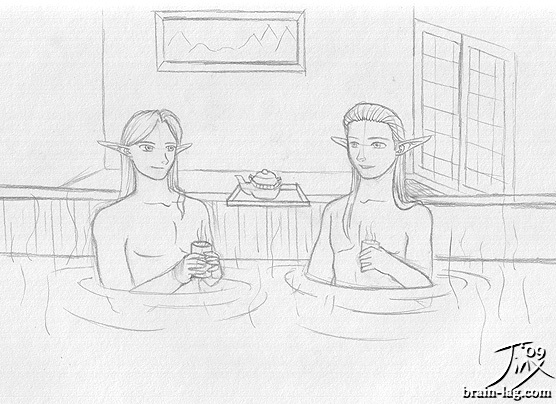 Krisiniel Larius and his father Nioreshtan relaxing in a faux hot spring – achieved through coals – while on the march with the Therian army. This scene appears 1-2 years prior to the story. 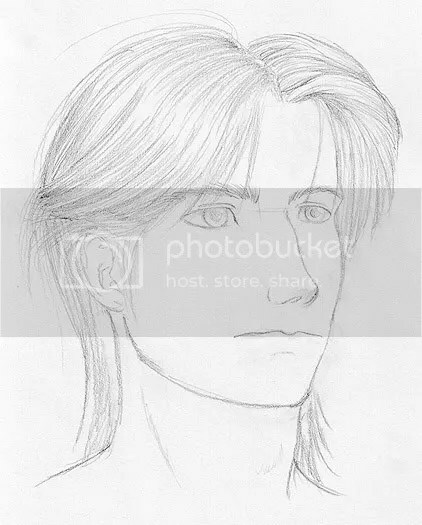 Concept art of Krisiniel Larius – Shiani‘s brother – from my novel Eyes of a Dragon. 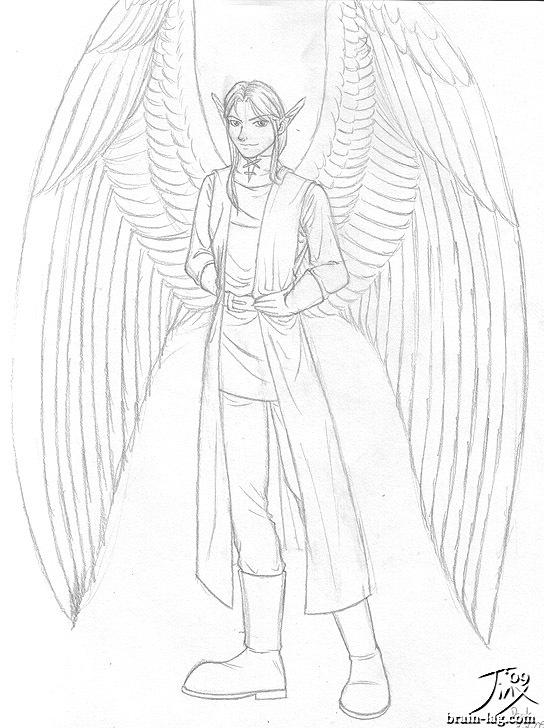 This was an older sketch – two or three years, before I cleaned up and elaborated on it yesterday – and the outfit design is a bit older still. I still rather like the design, but it’s a bit too fancy for the character. And if he was going to wear something like this, his hair would not be down. It gives a general idea of how he looks, though. Nayori Trevaulle accompanying her merchant father on a routine business trip, shown here with his wagon driver at the time. I picked a more cartoony style for this drawing because I thought it suited the scene better. I also didn’t know until I drew this that Nayori had freckles, though she does seem the type. This scene takes place 5-7 years before the story. 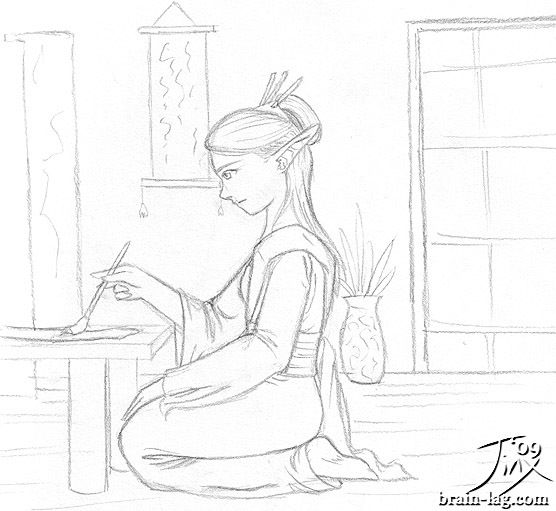 Krisiniel Shiani, the most educated of the humble Krisiniels for her gift with magic, practicing her calligraphy at home. This was the drawing I actually did first, and as it’s more of a visual expression than a specific illustration, really, it could happen almost anytime prior to the story, though she does look a little older than I intended her to. Look for illustrations of other characters to come! Although, I suppose I have already done a picture from Marlin’s past. Posted by thejinx in eyes of a dragon, writing. It’s been a little while since I’ve done an update on writing, and much has happened since the last one, so I think it’s time to bring you up to speed on my progress of late. A few weeks ago, I read The Well of Ascension by Brandon Sanderson, the second Mistborn novel. (I’ve really been putting off my book reviews, but short story, it was amazing.) It proved immensely inspiring to work on my own fantasy epic and first attempted novel, Eyes of a Dragon, and development has proceeded strongly since. The first thing to come together was, fortunately, the thing that had been bothering me the most about it, the much broader conflict only introduced in Eyes. Though I ended up using the same ideas I had already come up with years ago, I finally solidified those ideas and now have a good idea of where the story is going after the end of Eyes. Shortly thereafter, I checked out from the library Handbook to Life in Medieval and Early Modern Japan, to help define the elves in my novel as a more eastern-influenced, and singular, culture. I’ve been making my way through it and aside from being terribly interesting on its own merit, it has given me some great ideas and a pretty good mental picture of what the elven society is like. What followed was intensive character study, first of the leading elves and then the lead humans and those in between, that culminated in about two solid pages of text last night detailing the backstories of the six major characters in Eyes. I’m really pleased with the way things have come together and now have a pretty good idea of where each character is coming from. The only major point left, then, is setting, and for that I mostly just need to sit down and draw out a map. I’ve done a thumbnail sketch in my notebook and have some concrete ideas about how the continent of Menois is going to look, I just need to flesh out the rest of the land and determine how the human and elven settlers laid out their separate countries from there. More worldbuilding of course is also needed, for which I’m particularly looking forward to the final chapter in the Handbook, daily life, as well as another book I picked up recently, A Brief History of Life in the Middle Ages. I’ve done a good bit of research on the topic over the years, but some more reading is never remiss. Granted, I have already written quite a bit of Eyes – 58,000 words, by latest count here – but I don’t think I should have to change much to accommodate this development. I anticipate adding a bit into what I’ve already written before I continue where I left off, but for the most part, I’m still pretty pleased with what I already wrote. As to more personal reactions to all this, I’m thrilled. I’m a little disappointed that The Fire Within is once again not working out as well as I’d hoped and has been securely back-burnered, but my joy at how Eyes is coming together is overwhelming that by a good margin. I’ve also found my own examination of The Well of Ascension fascinating. While I’d always agreed that reading was important to a writer – and just plain enjoyed it, besides – and got inspired by books I’ve enjoyed, this is the first time that I’ve purposefully examined a book to determine what about it made it so good, and how I can incorporate those elements into my own writing. For a long time, I pretty much just wrote as I saw fit to tell the story, and while I took lessons from previous endeavors and attempts to improve later writings, it’s only in recent times, from writing three novels to completion and actively studying books I admire and researching, that I really feel like I’m beginning to understand and grow as a writer. I feel, well, like a writer. And that’s a pretty good feeling. Posted by thejinx in enduring chaos, eyes of a dragon, halcyon, writing. Writing has not tapered off since the end of NaNoWriMo. Far from it. Since December began, I have been hard at work on Halcyon, and as of last night, I have completed version 0.9 of the novel. What does this mean, precisely? In short, I’ve completed my major edits to the story. In long, unlike Aurius, my NaNoWriMo novel of 2007, Halcyon was pretty well planned out when I started writing it. I knew who the characters were, the background/setting of the story was well developed, and I even had an outline of how the story was going to go. I had a road map for it, the only thing I had to do was see what the sights were outside the windows along the way. As I actually wrote the novel, however, I realized that I passed by some of those sights too quickly, that some sights that seemed simple were more complex the closer I looked at them, and some turns in the road that should have been breakneck, hairpin corners turned out to be slight grades, and it was not perhaps the most interesting ride it could have been. But enough of the metaphors. The point was that there were a few significant changes I wanted to make, more exploration of a much larger cast of characters than I tend to deal with, and generally more to add to the story that really added something to it. Plus, there was one fairly important flashback that I never got to writing in the original draft. So, since I initially concluded the story, I have been going through the story and making all the major changes I have wanted or needed to make, and I have now done just that. The edits I have made to the text have been more or less minor. The majority of the writing has remained roughly the same and the same things happen in the story, just some of them now happen in a different way. There is also a significant amount of more material, adding about 23,000 words mostly in the first half of the story. The reason it is version 0.9 is because I haven’t had a chance to go through and reread it since I’ve done all my major edits to it yet. Although, I did spend some time doing just that today, cleaning up and making far less significant changes to over half the story. I’ve gotten some excellent feedback on the first version of the story, concluded on December 1st, primarily from a coworker who has done a number of wonderful sketches of characters and locales within the story. I’ll have to see if I can share some sometime; I’m really quite blown away by his enthusiasm. So, I’ve updated Halcyon‘s status on the novels page linked above. After this thorough start-t0-finish readthrough, and possibly – hopefully – any further comment from coworkers with whom I have also shared the story, the novel will be considered complete. I must thank one of the writers whom I met on WordPress during NaNoWriMo, who shared information about the amazon.com Breakthrough Novel Award on their blog last month, and whose name I have unfortunately forgotten since. Submissions for the contest are open during the first week of February, and it has provided an excellent goal for me to complete my edits on the story, and it would likely not be nearly so far along now if I had not heard about it. So, cheers to whoever it was that mentioned the contest. Now that Halcyon is starting to wind down, I’ve started thinking about what I’m going to be writing next. I have two novels on the go: Eyes of a Dragon and The Fire Within (working title). I began writing Eyes successfully for the first time in fifteen years of off-and-on planning last spring, and I am decidedly farther along in the story than I have ever been. It is my pet project and I am simply thrilled that it finally seems to be working this time. On the other hand, some brainstorming and idea-bouncing I’ve done tonight has me thinking again about TFW, which was the first novel I wrote to completion, but is in the process of being more or less rewritten as I try to improve upon it. We shall see. As much as I would absolutely love to finish Eyes – though it will need somewhat significant editing of its own before it’s ready for the public – I think I would be perfectly content to let my muse take me where it will. As long as I’m writing, I don’t think it really matters.